We serve Shougetsu original full course dinner at a restaurant. Traditional Japanese vase unique menu has been loved by many repeating guests. Our menu changes by the seasons. Appetizer dish has many seasons' best item come with beautiful display. miso soup & Japanese pickles and special handmade desert. There are la carte and drink menu as an optional menu. * Dinner time could be change depend on your reservation situation. If there are any requests, please let us know when you make reservation. 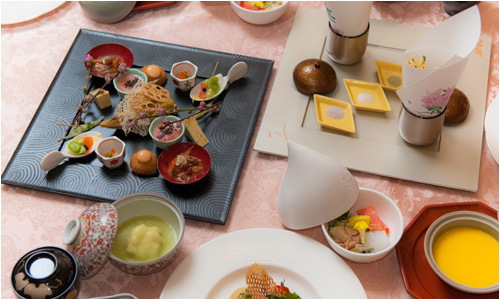 * If you would like to be served dinner dishes at a hotel room, there is extra charge 2,100 yen per person. please let us know the request before your stay. We serve many valuation great breakfast buffets at restaurant. There are Japanese, western and Hakone local menu as well. 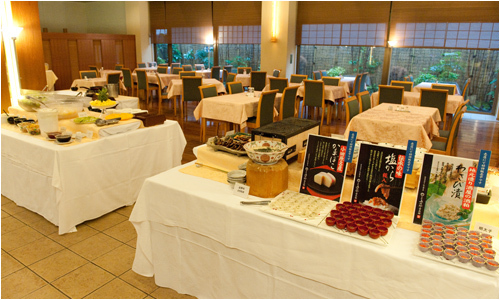 We are selling Hakone original food at morning market next to the restaurant or mini convenience store. Your newly day start from our fresh meal.